Sometimes, students can be a bit intimidated by Wikipedia. Writing for Wikipedia is as challenging and rigorous as typical academic work, and there’s no reason that unfamiliarity with the Wikipedia writing process should stand in anyone’s way. That’s why we’re building so many tools to help students write for Wikipedia. Last term, we debuted our online trainings. At the end of that term, we’ve heard some great feedback from instructors who used them in their course. Today, we’re adding a new, decidedly analog tool for students. 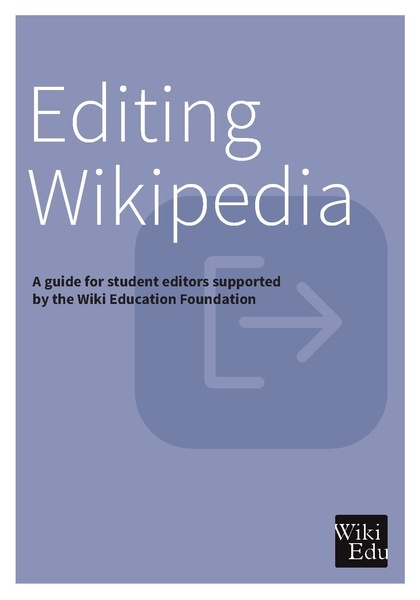 Our revised “Editing Wikipedia” guide is a start-to-finish kit that reflects everything we’ve learned about student editors. The handbook is a step-by-step guide for students assigned to write or expand a Wikipedia article. It starts with creating a Wikipedia account and finding the online student trainings. From there, each page is a reference for moving through the assignment. We’ve been working with hundreds of classes now, and we’ve tapped that expertise to quickly address the wrong kinds of challenges, and steer your students to the rewarding ones. The results are in this guide, which we hope becomes a “second screen” while students develop their articles. It’s designed as an offline, tactile complement to our online student training. We envision one laying beside each student’s keyboard for quick, easy access to the information that they’ll need to know. In the past, we’ve mailed participating courses a broader guidebook designed to help any new contributor to Wikipedia. The 2016 edition of “Editing Wikipedia” focuses on what students need to know to edit Wikipedia as a class assignment in our program. We’ve removed things students don’t need, and replaced them with sections on adding images, moving out of sandboxes, and other common student challenges. We think the guide will help more students successfully complete their assignment. We’re providing print copies of this guide free of charge for courses on our Dashboard. It’s also available to the world as a .PDF file. Please check it out! And if you’re not participating in our Classroom Program already, take a look at the rest of the resources we’ve created to make teaching with Wikipedia as rewarding as possible.